Tiny houses are considered net zero buildings, which are structures that consume less energy than the energy that renewable sources such as solar panels generate on the site. Since tiny homes use less energy, it’s easier to power them with renewable energy sources. They also require fewer materials to build, so less energy and natural resources are wasted during their construction. Additionally, tiny homes are easier to fully insulate, which further improves their carbon neutrality. They are also more sustainable; they are easier to heat and cool, and don’t have room for unnecessary electronics. As a result, many tiny homes can be run on just a few solar panels. In addition to using less power, they also use less water because they are equipped with smaller showers and water heaters. Many tiny homes can be outfitted with purification systems to collect rain water and filter it into usable, drinkable water. Tiny homes cost a lot less than traditional homes as well. Along with lower initial costs, they also require less land to sit on. Having less land means that homeowners have a smaller lawn to maintain. Additionally, maintaining a 300-square-foot home is a lot less expensive than maintaining a large 2,000-square-foot home. While the current average new home costs $450,000, average micro-home cost around $150,000. You could save a tremendous amount of money by living in one of these cute but practical homes because they cost far less. Monthly expenses are also drastically lower than an average sized house, further reducing the total cost of ownership. Housing is a major problem for people in lower income brackets. To purchase a home could easily demand 40% or more of one’s monthly income, causing dangerous debt-to-income ratios and financial instability. Under such circumstances, it can be difficult — not to mention risky — to obtain a mortgage loan. As a result, long-term renting is often the best option for a family that can afford it. Because there is a lower barrier to entry, renting is a way of life for many people. Unfortunately, renting doesn’t offer the benefits of ownership. Renters are subject to evictions, non-renewal of their leases, and rent increases at the discretion of a landlord. Even more important, though, is their inability to develop an asset, which is one of the keys to financial security and amassing wealth. Tiny houses present an “upmarket alternative” to the conventional mobile home. Often more affordable and rife with character, tiny houses trump the trailer in more ways than one. In fact, they often prove to be a better option for low-income families across the board because, as a path to financial freedom, tiny house ownership makes a lot of sense. On average, the price tag of a pre-built tiny house is roughly $40,000. By comparison, the median cost of an American home runs approximately $170,000. And depending on where you live, the average house cost can be significantly higher. 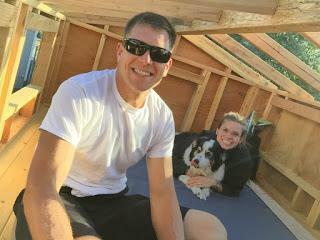 If you factor in the private mortgage insurance, interest owed to your lender, and property taxes, the tiny house is a fantastic financial decision. You may be surprised to learn how much money people spend on items that they don’t need. However, they are less likely to buy things they don’t have to have if they don’t have the room to store it. This allows them to minimize clutter and get back to figuring out what’s really important to them. If worst comes to worst, all of the money a tiny house saves you will more than cover the cost of purchasing additional storage. 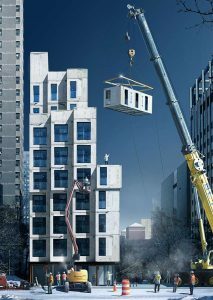 Micro-homes come in all shapes, sizes, and forms. Many people are choosing to downsize because they desire a simpler, debt-free type of living with many different options to enhance. Kacey Copeland and Catherine Norbeck (the “Copebecks”) are part of this unique community of people who have elected to walk away from the 3BR/2BA status quo and instead live in homes that are almost comically small. Like trumped up dollhouses for adults, tiny houses have a very enthusiastic following, comprised both of participants and outsiders looking in. Part of their intrigue is the creativity required during planning and construction of these small dwellings. Just like any other home, tiny houses must have areas to cook, store food, bathe, wash clothes, and sleep. “Going tiny” normally forces one to pare down his or her possessions. The design must accommodate a person’s final inventory, which includes the stuff that reveals the needs, hobbies, and values of the resident. Kacey and Catherine’s dwelling is no exception. Sporting a 24’ by 8’ trailer as a foundation, their new home showcases the things that are most important to them. 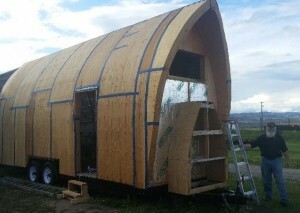 Consider Gordon Nelson, a Computer Services Professional living in Bozeman, MT, who built his own tiny house. As an avid fan of architecture, Gordon wasn’t satisfied with an orthodox design for his creation. He decided from the outset that just because he was going to live in a house the size of a shoe box didn’t mean his home had to be the shape of one. Gordon is also an avid fan of movies, video games, and painting miniatures. Unlike other tiny home owners that want to get rid of collectibles, Gordon didn’t build his tiny house with the intention of giving up his favorite things. 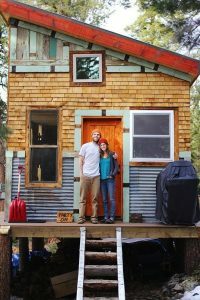 While most people that opt to live in tiny houses want to simplify their life, Gordon says that going without these things “just isn’t his style.” The most recognizable evidence of his hobbies is literally hanging from the walls. There, draped across his biggest window, is a 60-inch projector screen he uses to watch movies and play video games. 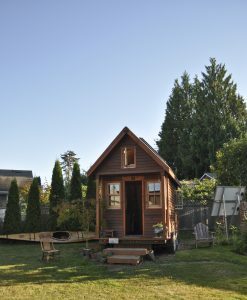 To some, his commitment to the lifestyle changes required by a tiny house may seem unusual. After all, Gordon seems better suited for the gaming table in the back of a comic book shop than for a 160 square foot Gothic arch on wheels. The long and the short of it is that tiny houses are not a phenomenon limited to those people whom we expect to have them. Gordon’s home is not the only unique tiny house out there. Others have transformed old shipping containers, silos, old automobiles, and even dumpsters into tiny residences. Americans have continued to seek out bigger and better things in every aspect of their life. We’ve all heard the myth: success in America is a six-figure job with a corner office, a palatial estate, and a car so big that it rivals the buses of your local high school. It’s a mindset that has seeded itself deep in the American psyche. Nowadays, most people see a large house as the sign of success. So people strive for homes that are bigger and bigger. The problem is that most people can’t afford a mansion and since the real estate bubble burst, most individuals and families can hardly afford housing at all. A large segment of the tiny house movement is comprised of disenfranchised people who see a huge divide between the way things are and the way things are supposed to be. The most significant of their problems, however, are financial. People just want to throw off the shackles of debt and live on their own terms. A majority of people coming out of college do so without any industry prospects and a debt responsibility in the tens of thousands of dollars. (The real estate collapse of the mid-2000s forced Gordon to abandon the collegiate architecture program he had already invested years in). Add to that the typical 30-year mortgage required to purchase a home and you’re dealing with a debt prison that turns life into a money game. The good news is that there are other ways to achieve the American Dream. For those willing to forego the benefits of the “normal path”, life can be much different. For some, life can also be better in a tiny house. Those seeking financial improvement or a more environmentally friendly lifestyle aren’t the only demographic to pursue tiny house bliss. Retirees, no longer tied to a location by full-time employment, are some of the biggest proponents of going small. According to Ryan Mitchell, the managing editor of TheTinyLife.com, nearly 40% of all tiny house owners are over age fifty. A tiny house is a great aid toward achieving some of the common goals of retirement. Mobility allows for comfortable travel, close quarters provide more time with a partner, and who hasn’t heard retirees allude to their need to size down? Another group more inclined to live in tiny houses are the location independent. American workers are detaching from their stationary roots in staggering numbers. According to estimates by one workforce website, as many as one in three Americans are freelancing. The internet’s ability to facilitate fast, reliable communication is eliminating the need for a large in-office workforce and is allowing employers to reduce costs using remote employment. The use of location independent workers (freelancers, consultants, contractors, etc.) is expected to continue to rise as efficiencies in manufacturing, technology, and labor continue to increase. For the individuals who choose (or are forced into) remote employment, a traditional house may no longer be a necessary investment. Many people choose a place a live and stay there for the long haul, partially because employment requires it. As the proximity-related ties to our employers are severed, more people will have the freedom to move often and travel freely. Such lifestyles are conducive to tiny house living, even if it isn’t the norm. Curious to read more? Check out our story, “Living Tiny“. Why Would Someone Live in a Tiny House?